The classic sound of blazing, overdriven vacuum tubes never goes out of style. The Behringer TO800 overdrive puts rock's most powerful vintage tube sounds at your disposal. 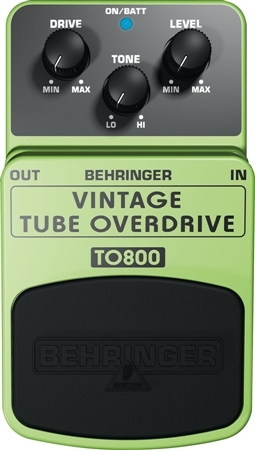 The Behringer TO800 overdrive puts rock's most powerful vintage tube sounds at your disposal. The classic sound of blazing, overdriven vacuum tubes never goes out of style. This sound is at your command with the TO800. Recreates the sound of real tube crunch, with the original 4558 op amps and legendary MA150 distortion diodes, the TO800 is very faithful to that of vintage tone machines that made rock and roll history. Dedicated drive, tone and level controls let you shape exactly the sound you want. The status LED tells you when this pedal is activated, and its top-quality on/off switch gives you the highest signal integrity in bypass mode. You can power the TO800 via a 9 V battery or a PSU-SB DC power supply (not included). Want the sound of a tube amp on your digital amp? For very good price, you get it. It is plastic, not metal. So? Buy two if you are worried about one breaking. Have a back up. It sounds like an Ibanez Tube Screamer. Well Worth the looking at ! Much better than expected !! Honestly I would give it 5 stars if it was not plastic. I didnt expect much but it could easily be 60 bucks and still get my four stars.Ive been playing since 1984 so I have a little experience with pedals. If Your looking to add that t-screamer edge at studio levels this is the perfect pedal. For the price, it's a fantastic budget OD pedal. Is it a little bit noisy? Sure, but I can overlook that because im getting great boosted tones for THIRTY DOLLARS. No reason to spend more money for the same effects, this pedal is a fraction of the cost of most and works like it is supposed to, feels heavy and durable as well. Save yourself a ton of money and buy this instead of the overpriced tube screamer. Unless they're a super audiophile or looking at your pedal board nobody will know the difference. These pedals are fantastic! Sounds just like a TS808 tube screamer. The pedal is made of plastic, but still seems quite durable and well made. Time will tell. As for noise, it’s comparable to the Ibanez and most other overdrive pedals which are somewhat noisy by nature. I am very impressed with this pedal.